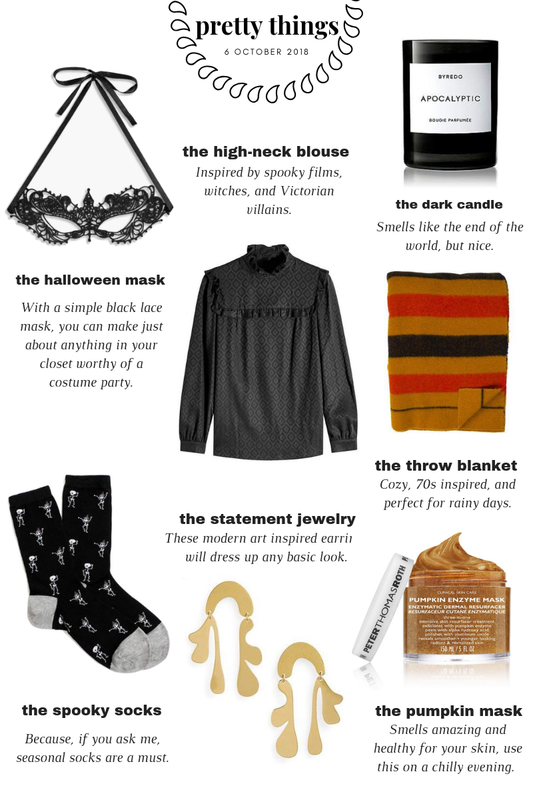 This month is about all things cozy and warm but also a little bit dark and spooky. I’m celebrating October with my favorite “scary” movies and taking inspiration from them for this weekend’s edition of pretty things. When it comes to Halloween costumes, I’m the type of person who tends to like dressing not as anything in particular but in a generally chic outfit with a spooky element added on. The perfect thing is this lace mask. You can really put together any all black or white outfit and add this on top to make a chic and easy Halloween costume. This A.P.C. high-neck blouse made me think of Victorian and Gothic fiction like Daphne du Maurier’s Rebecca, Sleepy Hollow, and Mia Wasikowska in Crimson Peak. In real life, though, it would look great with a pair of jeans and suede ankle boots! The Apocalyptic scent from Byredo is so good for October, as it was inspired by “a landscape of ashes and despair”. Sounds depressing, but smells really good and will get you in the mood for Halloween. It has notes of white-hot iron, black raspberry, oak moss, papyrus, dark wood, and birch. This Hermès Rocabar wool blanket, with its 70s inspired color palette, is like an expensive version of something you’d see in a vintage shop. It just looks like the perfect thing to wrap up in to read or watch old movies. One of my favorite go-to masks for fall is the Peter Thomas Roth Pumpkin Enzyme Mask. I used it all the time in college because it smells amazing and exfoliates with pumpkin enzyme, AHAs, and the same crystals that are used in microdermabrasion. I’m absolutely obsessed with these fauve-inspired earrings from Madewell. Artists in the fauve movement like Matisse and Derain were known for flat, fragmented shapes like what you see with these earrings. They’re the kind of thing you could pair with a basic white tee and jeans for a carefree, French girl vibe. I have a tradition of buying a pair of themed socks from J.Crew every season and this year, I’m proud to say that I used rewards and coupon codes to get three pairs of socks for $2. Yes, two dollars. I love this pair with dancing skeletons for Halloween!